I always feel less stress when things around me are organized and “in their place”. Having order seems to have a calming effect. I get cranky when my home is chaos! This Spring, I’ve been going room by room and cleaning and organizing. John and I have accumulated lots of “stuff” that we no longer have room for. The things I do want to keep desperately need a home! One area that always gets messy is in front of the TV where the Wii and Game Cube are situated. There’s games thrown haphazardly on the floor and controllers everywhere and I’m tired of looking at it! When I received my Printed Storage Cube from Company Kids I knew EXACTLY it’s job. Now, I have all the games, controllers, microphones and guns stored neatly inside my Printed Storage Cube and I’m much happier. 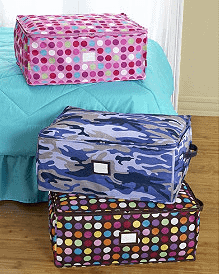 It’s nice and roomy with a zipper closure and sits by our TV in the living room for easy access. Bins and boxes are better than shelves. 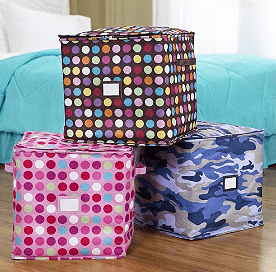 Open-top bins, boxes or baskets are best for toys. Why? It makes it much easier for kids to just toss in the toys. Plus, toys are still in sight — important for kids who worry when their favorite things are behind closed doors or in closed drawers. Keep bins and storage cubbies low and within reach of little hands. Relax! In the beginning, avoid rigid rules like all the blocks must go in THIS bin, and all the dolls must go in THAT bin. You’re just setting little ones up for failure – and setting yourself up for frustration. Focus on establishing the simple habit of picking up toys, period. You can work on Martha Stewart-style organizing later. Mix it up. Provide a variety of storage options to complement bins. Plastic tubs are great for tiny toys. Laundry baskets are an easy solution for balls and sports equipment (the vents allow for air circulation, too!). A small hammock makes a fun bed for stuffed animals. Give kids a role in deciding what goes where. Does it really matter if the blocks are on the left side of the room and the Legos are on the right? Let kids have a sense of ownership in the process, and you may find they’re more enthusiastic about cleaning up. The Ballerina Stars Appliqued towel set. I also like the Pinwheel Quilt Bedding. I want the boys’ bedding with the airplanes on it! My son would love that so much!! Do you want us to leave the twitter link??????? I also like the “Brandon Bench”. I love the Owl Quilt Bedding (sheets, quilt & shams). Soooo cute! I like the cool Plane Hooded Towel ..my son would love to zip around with that on after his bath! I love the Big Dots Rug – Pastel.